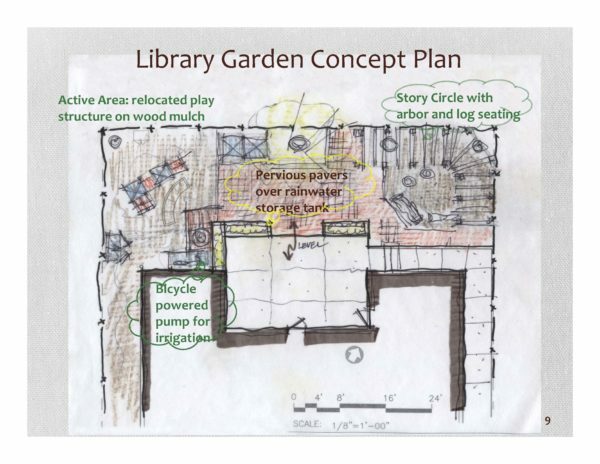 Earlier this year, the Friends of Elmhurst Library (FOEL) reviewed a preliminary concept plan for developing the back garden area of the Library. 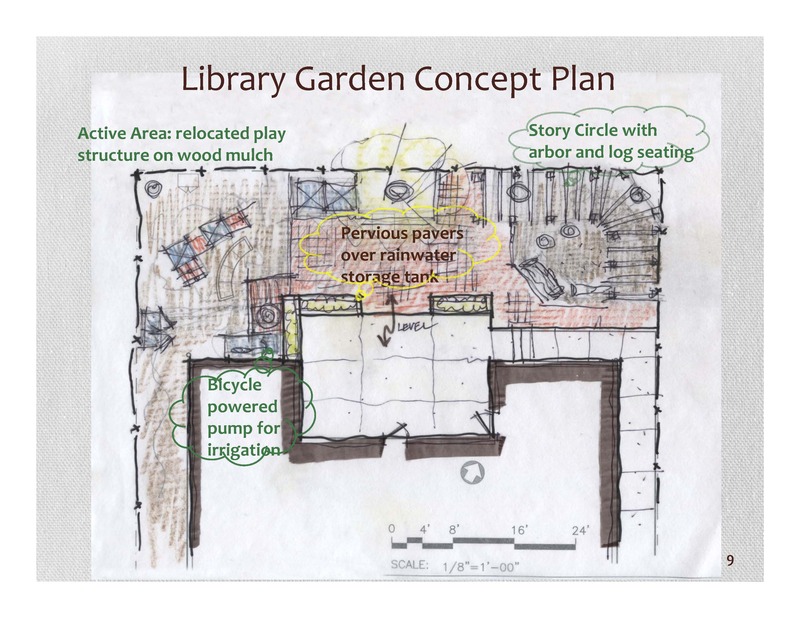 The plan proposes to create a “Reading Circle” on the east side of the garden. The existing semi-circular teak bench would be moved here to anchor the reading circle. 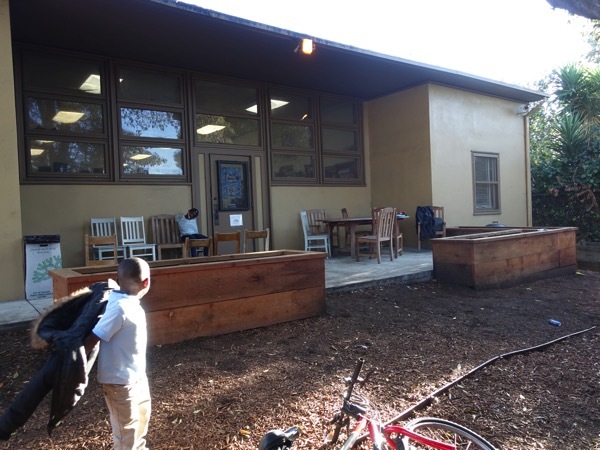 The reading circle would be completed with log bench seating and painted tree stumps. This area would be “paved’ with decomposed granite which makes it easier to sweep up leaf debris and will be less muddy during the wet winter months. The Reading Circle will also have an L-shaped wood arbor along the fence line. 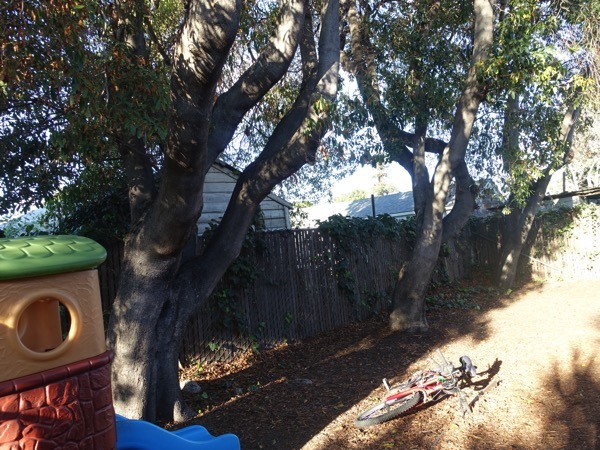 The existing play structure will be moved to the west side of the garden, surrounded by a generous layer of engineered wood fiber (EWF) for safety buffering. 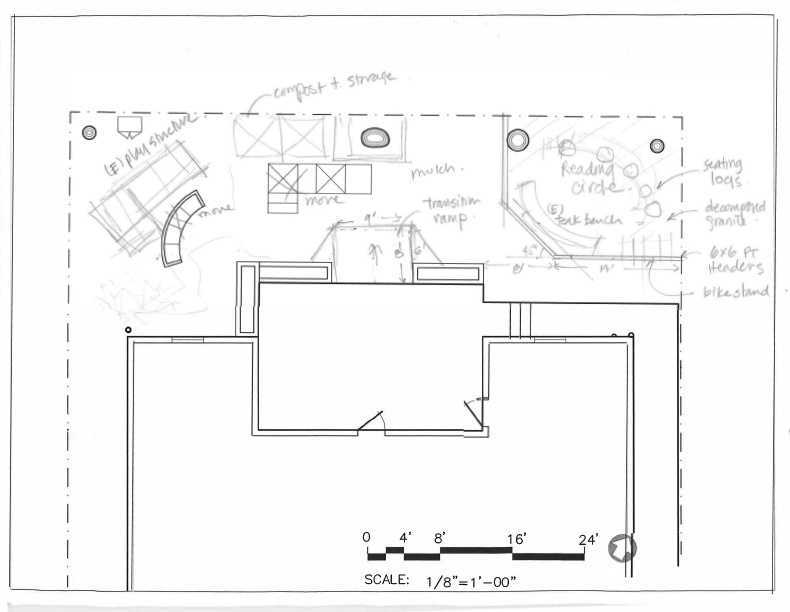 The central part of the garden is where an underground water storage tank would be installed. The tank will be filled with rainwater from roof and pavement runoff during the winter months and later used to irrigate the planters. A bicycle powered pump (to be pedaled by kids) would be installed to draw out the water to fill the watering cans. The image below is a pared down plan that is proposed as a Phase 1 development. 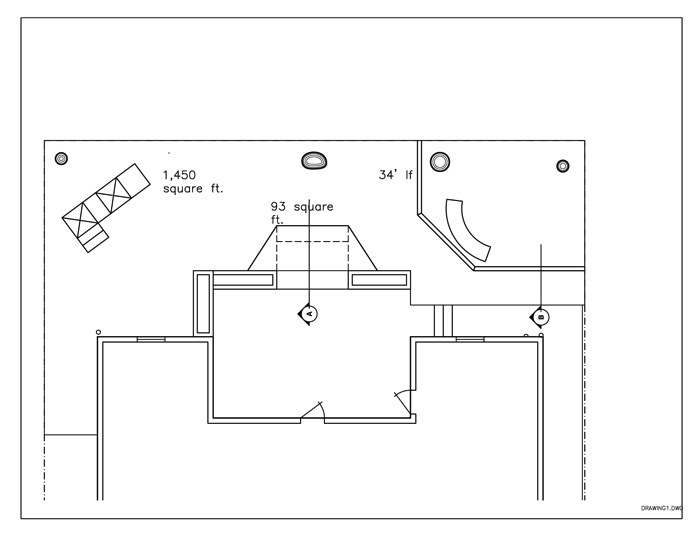 The plan addresses an ongoing safety concern that has top priority: there is a two to three inch gap between the edge of the concrete patio and the existing grade. Kids running off the patio into the back garden are not always aware of the sudden drop-off. 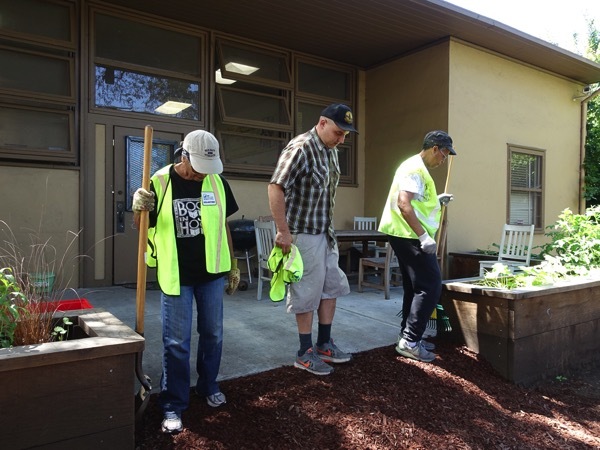 The FOEL volunteers have tried to mitigate this trip hazard by adding and compacting garden mulch to create a smooth transition, most recently on Earth Day on June 10, 2017. 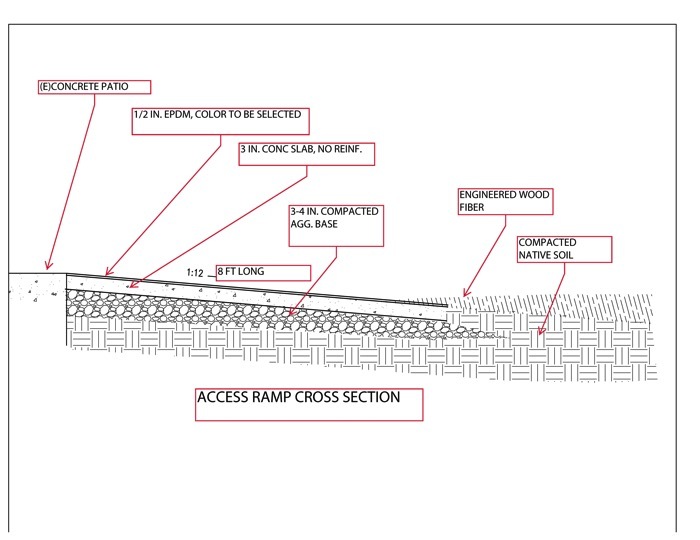 A permanent transition ramp would cover the full width of the opening between the two planters, extending 8 feet into the garden area with a gradual slope of 1:12 (1 in drop per foot traveled). The ramp is constructed as a 3 inch thick concrete slab covered with a 1/2 inch layer of EPDM (colored rubber granules bound with adhesive). The following is a partial material takeoff, showing the approximate quantity of materials required for construction. Public Works has been contacted to assess the health of the Pittosporum trees. The tree at the eastern end of the garden, in particular, appears to be in decline (loss of bark on lower trunk; dry brown leaves). A preliminary estimate, subject to updates, is here.